PETPLAZA – SHOP FOR YOUR PET FROM THE COMFORT OF YOUR HOME! 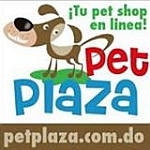 The first online pet store in the Dominican Republic providing pet supplies, food and more. They also have a fun store that I enjoy visiting with my mom. It is located at Av. Enriquill0 #91, Urb. Real, Santo Domingo, Dominican Republic. Natural Flea & Tick Control that are safe for your home and your pets: repellants, sprays, squeeze-ons, shampoo, flea tags and powder. Try a natural and effective approach to flea control, free of harmful chemicals!